The Stations of the Cross is a service typically done on Friday evenings during the season of Lent. It’s fitting to meditate on Jesus’ passion and death during the somber time of Lent. The church echoes with the words, “We adore you, Oh Christ, and we praise You. Because by your Holy Cross you have redeemed the world.” This powerful prayer said before each station reminds us of why we are there. For forty days we meditate more on Jesus’ passion, give up things we enjoy as a sacrifice and grow in prayer. Of course we want to rejoice during the Easter season, but more often than not, the week after Easter we forget how powerful our prayer lives have become. After Easter it isn’t really a daily thing to meditate on the Stations of the Cross until the next Lent rolls around. Then we hit our knees again and think about the greatest love story ever told. But why not include the stations into our daily prayer lives? I realize it is not Lent, but let’s dive into Jesus’ great love for us and see how the stations apply to our own lives. This first station speaks volumes of the obedience Jesus had to his Father and the heroic humility he had. Here is God being condemned. A completely innocent man condemned to the worst kind of death; crucifixion. The crowd chanted his condemnation. The very people he was to save were giving him a death sentence. It’s hard to imagine the pain Jesus felt when he looked at them with unbelievable love and they returned the look with hate. 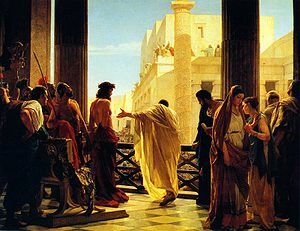 Pilate, the man who could have prevented this, turned to his own selfish motives and handed him over to be crucified. The list could really go on and on with ways we can stand up for Jesus in our everyday lives. Ways we can be those people in the crowd who don’t join in with the “Crucify Him,” chants. This first station, Jesus is condemned to death, really can hit home with a lot of us. There is a beautiful opportunity, probably more than once a day, to reflect on this station and apply it to how we live and how we treat each other. Challenge: Pay close attention to situations in your life where you are able to stand up for God and for your faith in whatever situation God places in front of you. Be the one in that crowd that defends Jesus, and pray for those who persecute you.